Matt Roman is a full time musician and has performed in the US, UK, and Europe. He has studied jazz with Pat Martino and Tom Kozic, played bass for blues master Bobby Radcliff, and performed with Jon Popper (Blues Traveler) and Charles Fanbrough (Jazz Messengers). He has opened for countless famous jazz, rock, and blues artists. Some of his various projects includes KIND OF BLUE (jazz and jam band material), ROMAN & THE HEARD (hard rock and originals), The FUX (punk rock), The HARD LICKERS (local cover band), ROMAN ALONE (solo jazz & blues guitar instrumentals) and most recently GLUE FACTORY, an alternative original rock band. 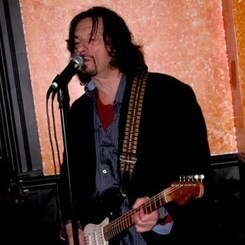 Roman also teaches music, runs local jams, has won numerous local music awards, and organizes musical benefits for kids. He is a Musical Director for the Upper Bucks Alliance for Creative Expression (UBACE,) a musical organization for kids in his local Bucks County, PA.
Roman appears on 5 full length CD’s and many compilations. He has done some background work in TV and movies and music scores for independent film. He currently resides in Perkasie, PA and plays regularly in Philadelphia and NYC. Request Lessons with Matthew Roman today!